More than £2billion of Government money will be spent on improving roads in East of England, including the A14, A47, A11, A12, A1(M) and M11. Highways England, along with suppliers and stakeholders have today, Tuesday September 29. set out how and where the investment will be spent to bring road improvements and repairs between now and 2021. Plans include major improvements on the M11, A5 and M1, A1(M), A12, A14, A47 and A428. 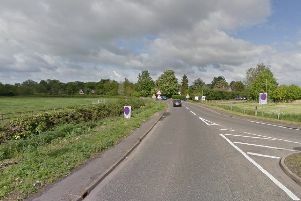 * A14 Cambridge to Huntingdon major improvements – this scheme, subject to statutory processes, will involve building a new bypass to the south of Huntingdon and widening some of the existing carriageway near Cambridge, as well as the A1 between Brampton and Alconbury. * Upgrading six sections of the A47/A12 corridor in Norfolk across a 115 mile section of the A47 between Peterborough and Great Yarmouth. This will include converting almost eight miles of single carriageway to dual carriageway and making improvements to three junctions, relieving congestion and increasing journey time reliability. * Increasing capacity on the A1(M) providing an additional 14 lane miles to relieve congestion in Hertfordshire, including Stevenage and Welwyn Garden City. * Upgrading technology at junctions on the M11 across Essex and Cambridgeshire, from Stansted Airport to Cambridge, which will improve safety, relieve congestion and support plans for additional housing. We will also improve junction 7 for Harlow to increase capacity. * Providing technology along the A12 in Essex and Suffolk from the M25 to Ipswich and widening the stretch between Chelmsford and the A120 to three lanes, adding 30 miles of additional lane capacity, improving safety, reducing congestion and supporting economic growth. * Providing a new 13-mile stretch of dual carriageway on the A428 between western Cambridgeshire and the north east of Bedfordshire, relieving congestion, improving safety and supporting significant levels of planned economic growth in the area. * Building 17 new cycle paths across our region including along parts of the A12, A47, A120 and A5. Roads Minister Andrew Jones said: “As part of our long-term economic plan, we are making the biggest investment in roads in a generation. The £2 billion investment in the East of England between 2015 and 2021 will significantly improve journeys and help create jobs. Ken Simmonds, Highways England’s Director of Major Projects in the South and East, added: “These improvements will bring significant long-term benefits to road users on motorways and major A roads in the East of England, as well as to local residents and the economy as a whole. “They will create vital links at local, regional and national level to unlock growth, increase capacity and tackle congestion. “We’ll look to deliver these schemes with local communities in mind, using designated funds where relevant to address environmental issues and air quality. “The construction work will, of course, bring some disruption in the short term but we will ensure that we keep this to a minimum to keep traffic flowing. Highways England East Divisional Director Catherine Brookes, added: “It’s vital that we continue to improve the existing road network which is why we’re also investing millions of pounds on resurfacing, safety barriers and other maintenance projects across the whole Eastern region. “We’ll be spending more than £81 million this year alone on maintenance and smaller scale improvement schemes. Motorways and trunk roads form the backbone of the region’s economy and this huge investment will ensure they remain healthy for many years to come, as well as improve safety and journey reliability. * A47 Acle Straight - Safety improvements at key hotspots and joint working with Natural England to establish environmental impacts and mitigation measures for the medium and long term which could include installation of safety barriers, junction improvements and road widening or capacity improvements. * A12 carriageway between the M25 and the Chelmsford bypass – Widening to three lanes and providing technology to provide greater traffic information and potentially ramp metering at junctions. More about Highways England Delivery Plan 2015-2020 at gov.uk.